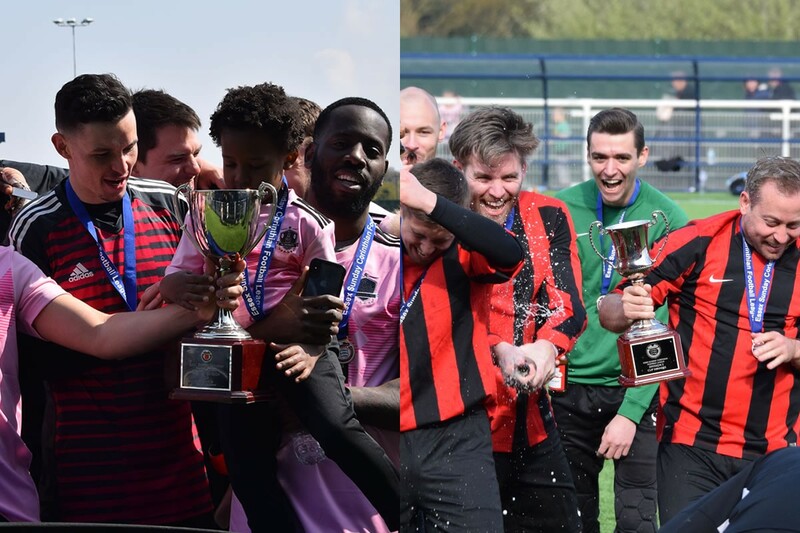 El Valiente secured their first honours in their Corinthian League as they put in a terrific performance to overcome the efforts of their local rivals, Flanders, in Sunday's Premier Division Cup Final. They were ahead midway through the first half with a set piece floated into the back post where Edwards was awaiting to hook the ball past the keeper. They then extended that lead just before the break as Field was sharpest to the following up as he stroked the ball away to make it 2-0. In the second half, Flanders came out looking determined but a crucial third goal was scored shortly after the restart, the ball falling to Field on the edge of the box and he drove his effort in off the underside of the crossbar to make it 3-0. Flanders tried to cut that deficit, forcing some smart stops from the El Valiente keeper but their efforts were in vain ultimately. Congratulations to El Valiente on their victory and to Flanders for failing to give up throughout the ninety minutes. In the day's second match, Goresbrook returned to Aveley for their second successive season and left with some silverware once again as they defeated Barking 2-1 in the Division Two Cup Final. The early exchanges were very even but both sides had two keepers who needed to be in top form, making some terrific saves to keep their sides level. But Goresbrook broke the deadlock towards the end of the half with a stunning free-kick into the bottom corner that gave them a 1-0. That lead was then doubled less than two minutes after as Barrett got in behind and found the net from a tight angle to make it 2-0. Barking made some changes at the break in an attempt to get back in the contest and they halved the deficit with around twenty minutes to go as they netted from a corner to get a foothold in the game. They had good chances in the remaining minutes and the Goresbrook keeper had to pull off some top stops to keep his side ahead. Goresbrook could have finished it off with a third but a curled effort hit the bar late on. Alas, the two goals they had were just enough and it was the men in red and black who lifted the cup! Well done to Phil and the lads at Goresbrook for their victory and to Barking who, as expected, made this is a hard fought contest with little to seperate the sides on the day.